If there is one great truth about Canada's Rockies, it is surely this: Alberta is the epicentre of adventure. With our backbone being the Rockies, we've got awe-inspiring peaks, rushing rivers and wildflower-carpeted meadows. And more. Veer away from the mountains and the adventures keep multiplying. Dig for dinosaurs in the Canadian Badlands. Play on one of our 280 golf courses. Careen down a singletrack. Fly into a fishing camp. Ski through sinks of fluffy powder. Here in Alberta, the limits to what you can discover in Alberta's Rocky Mountain playground are set solely by your imagination. So, reach beyond your borders - and let Alberta take care of the rest. Alberta's saw-toothed Rocky Mountains and shimmering prairies are laden with all-star resorts, luxurious spas and award-winning restaurants. Surprised? That's what a visit to Alberta is all about. You'll find one unexpected adventure after another - like a soak under the stars in a hot-tub after a long day in the saddle, or a private chef's exquisite creation at the end of a dinosaur dig. 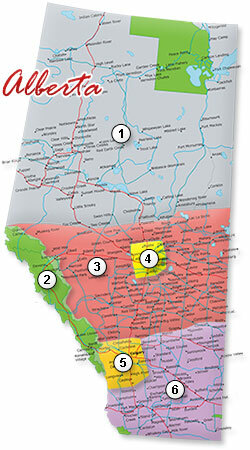 Such surprises are easy to orchestrate with Mother Nature's backing - precisely why the United Nations crowned Alberta with five of Canada's 13 UNESCO World Heritage Sites: Head-Smashed-In Buffalo Jump, Waterton Lakes National Park, Canada's Rocky Mountain parks, Wood Buffalo National Park and Dinosaur Provincial Park. While these jewels may sparkle today, they're not what first put Alberta on anyone's map. In this century, entrepreneurs and oil barons rush to Alberta, but yesterday it was cowboys, and back in 1883 it was railway workers who were leaving their tracks on this rugged landscape. Today in Alberta you will still find those eclectic footprints - stamped in our history, culture, food and spirit. A holiday here can mean exploring North America's largest concentration of petroglyphs; hiking to heritage lodges; exploring quaint old villages and cosmopolitan cities; shopping for deals at the world's largest shopping mall or enjoying a round of golf. Whether you choose to vacation in Alberta because of its snow-kissed mountains, its ranches, its cities or diverse cultures - there is one thing for certain, you will leave surprised. And convinced that Alberta belongs on everyone's life list.